The 1.7-liter, four-cylinder Mercedes-Benz 170 introduced in 1936 was the last design from Hans Nibel. Internally known as the W136, it was more powerful than the six-cylinder model it replaced, and designated 170 V. The V stood for vorn, indicating the engine was up front rather than in the rear like the unsuccessful 170 H (in which the H stood for heck). The 170 V featured a chassis comprised of three oval tubes, independent front suspension by transverse leaf spring, and coil spring rear swing-axle. Engine vibration was reduced by rubber mounts. 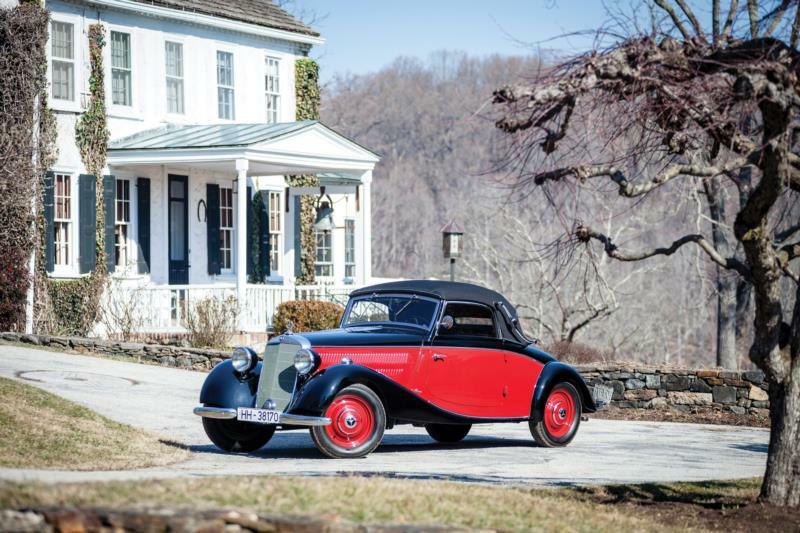 The 38-hp engine gave a top speed of 60 mph and body styles included two- and four-door sedans and cabriolets and even a roll-top limousine. More than 90,000 170Vs were built from 1936-42 and it was the first model built in the ruins of the factory in February 1946. Only 214 trucks, ambulances and police cars were produced that year. Production grew slowly, peaking at 13,101 units in 1949, as the 170 was modified with a streamlined hood and opening trunk. The Va model was introduced in May 1950 with tube shocks, a 1.8-liter 45 hp engine and bigger brakes. The Vb of May 1952 had a wider track, larger windshield and hypoid rear axle. By the time production ceased in September 1953, 49,367 units had been sold. Mercedes-Benz introduced a 37 hp, 1.8-liter diesel engine variation in May 1949, which proved extremely economical, though very slow and noisy. By 1953 a total of 33,823 diesel 170 Ds had been sold in four variations, many serving as taxicabs. A rare variation was the 170 D OTP version offered for police work in 1951-52. Technically a four-door cabriolet, it was more like a pre-war tourer with a flimsy top. Many were painted blue, but very few remain. In search of more performance, Mercedes launched the 170 S in 1949, with 52 hp and an aluminum cylinder head. The larger prewar body from the 230 model was fitted, gaining the W191 chassis code, and two- and four-door convertibles offered. Independent coil spring front suspension replaced the transverse leaf and top speed was now 75 mph. Meanwhile, diesel engines were also fitted to the 170 SD from 1953, at which point the new Ponton-bodied Mercedes-Benz 180 appeared, making the older 170-series car look very dated. As a result, the 170S body was discontinued and the original 170 V revived with the larger 170 S motor. It continued as an entry level offering until 1955. In the last two years of 170 sales, more than 80 percent of the cars were ordered with diesel engines, suggesting that cost-conscious taxi operators preferred function over form. That left the modern 180 to up-and-coming executives. Total 170 diesel production in both V and S models had reached 61,695 units when the model was discontinued in September 1955.